I am running with all the excitement and energy of a child, and the playful dog is running after me. He is the child of my beloved pet dog Kaloo – the one who died years ago. I have the feeling that Kaloo’s son is a continuation of his loyalty and dedication to me. He is playing with me as Kaloo did years ago. I have only a very slight awareness of the large house I am in, and am indifferent to the setting sun and growing darkness of the evening. Running with Kaloo Jr. has left me breathless, and as I sit on the roof of the house, the dog snuggles at my side. I embrace him, and breathing heavily, I think what a bliss it is to have Kaloo with me in another body, just like his own. Suddenly, I feel how long it has been since Kaloo died. The thought brings an instant feeling of loss. I look at the dog snuggled beside me, and he is no more there. My eyes opened and I woke up from the dream. I looked at my cell phone. It was past 6 pm. As I lay in bed, I suddenly smiled at the dream I had, with thoughts that my long-departed friend still visits me. He is more loyal than his kind is commonly remembered by humans. But I, despite being a writer for decades, never wrote a tribute to him. So it’s time to relive his memories, and share with the world the special relationship I had with my beloved dog for over 10 years. When he was first brought to our house, in September 1988, he was hardly a week old, lacking shapely balance in his small physical being. He was entirely black, except for parts of his feet and a tiny white patch marking the tip of his tail – something we found amusing and even made fun of. He was from the litter born to a dog couple, consisting of an Alsatian father and a Bull Terrier mother, at the house of my mother’s friend who lived nearby. My family thought a dog would be good to watch the house. But for me, the arrival of a living, breathing toy-like puppy that entirely belonged to us, was a real gift. And I just took to him. It was only the next day, after his arrival, that we had a small family meeting at home to give the dog a name. Various suggestions came and were criticized until my brother said that as the puppy was all black, the best name for him would be “Kaloo” (a nickname literally meaning the black one). This was approved and thus we welcomed Kaloo into our family. Kaloo soon became the centre of attention of the entire family. He was fed milk at first and as he grew up, he was given the food we ate. My mother, brothers, and I – all of us loved serving him food in his bowl. But only I. and my eldest brother, doted on playing with him. Kaloo sensed our special attention and would look for cues from us the moment we would step out of a room. In winter, he sat beside the mats we sat on, gathered around the fireplace. While Mother would rather have him out for the night, my eldest brother and I sometimes secretly allowed him in to sleep under the bed after our mother fell asleep. We were very sensitive to the thought that the dog would be staying outside on the verandah all night long in harsh winter. The following morning, we of course would bear Mother’s reprimands but never failed to allow Kaloo to stay in the room as many times as we could. Gradually, Kaloo bonded more closely with me than the rest of the housemates. I was empathetically sensitive to his presence. Somehow I felt that I could sense his mood – sad, lonely, excited, happy, indifferent, or confused, etc. More wonderful was that he reciprocated my empathy as if he understood my feelings the way some very caring person might. In fact, he was much better at sensing my mood. Many a time when I felt sad, but wouldn’t express it, he would come and put his head in my lap in a manner that only I could understand; in his way, he would say “Don’t feel bad. I am with you.” And his company was a very reassuring consolation. I too wouldn’t miss doing my part – patting and hugging him whenever I read a sad, or lonely, or heavy mood in his look. Summer was a special playing time as my brother would take us, (me, my younger brother, and Kaloo), out to a spring that flowed through the fields a little distance from our house. We would make Kaloo run with us to the spring, wash him there, and then let him run about in the fields. We laughed at his frisky, speedy run across the fields. There, we also played hide-and-seek with him, and he always sought us out in a matter of seconds. Back at the house, I never tired of playing with him by throwing a ball or other object at him, letting him pick it up, and then chasing him round and round in the house. As we slept outside in the yard in summer, Kaloo would wake me up each morning by poking his head inside the sheet I covered myself in, and licking my face. In his company, life had become a natural, innocent feeling of happiness and belonging. One summer, (I don’t remember what year, but it was before 1991, I think), my family suddenly decided to give Kaloo to my grandfather’s family that had just lost a dog, and needed one to watch their large house. I felt like I was being robbed by this decision of the elders, who are considered the authority in my culture, even over grownup children living with them. Being kids, we were not supposed to intervene. In my silence, I burnt in fear, anger, and sorrow. And the fears became real when the next day, Kaloo was delivered to Grandpa’s house, a kilometer from ours. Though we visited Grandpa’s house daily, sometimes twice a day, the thought of not having Kaloo at my own house was so somber, that I couldn’t help crying to myself. There was no question of eating that night. This mourning of mine was noticed by the family and, after a little discussion, the elders in the house said they would bring Kaloo back in the morning. I counted each tick of the clock until I fell asleep. The next day, my brother carried me on his bicycle to let us bring Kaloo back. We were half way from Grandpa’s house, talking about Kaloo, when my brother said, “Hey look at that dog! He looks like Kaloo!” We stopped, and I saw that it was Kaloo. He was running in our direction and looking back, as if worried about being followed. “He has clearly escaped Grandpa’s house,” my brother said. Kaloo spotted us too and was overjoyed. I was almost crying in joy now. He had proved that he was part of our family and was inseparable from us. I took him back home. He was also very hungry and constantly sniffing here and there, looking for food. We fed him, wondering why he was so hungry. Soon we learnt that at Grandpa’s house, they tried to feed him meat and bones – a dog’s ideal food – but he never even looked at the food. He was mourning separation, just like I was that night. And the first thing he did in the morning was find a chance to escape, as soon as someone opened one of the gates to the house. What a wonderful escape to make our day! In late 1996, I had to leave home and move to Peshawar city, 100 km from my hometown, for University. I missed home at first but, naturally, it was Kaloo and my younger brother that I missed in particular – both my childhood friends. On my biweekly to monthly visits home, Kaloo would greet me with a joy that no human has still ever shown me in my experience. Scampering all about me, he would sit right next to me, and follow me wherever I went in the house, even trying to go out with me whenever I went up to the gate to exit. He was like my shadow – staying where I was, and leaving when I left. 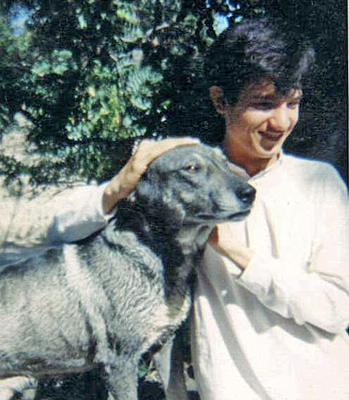 Then in 1998, I received the news from home that Kaloo had developed an infection in his foot. The wound had festered, and Kaloo wouldn’t let anyone inject medicine into his body via a syringe. I became very worried, and instantly got leave from classes to see Kaloo. He had grown weak, and his eyes had lost the energy and look of confidence that he usually carried. He couldn’t walk easily, and had to be carried from one place to another. For defecation, he just limped with effort toward the grassy part of the lawn. “Everyone is afraid of him,” my family told me. “He bares his teeth at anyone whom he sees with a syringe. Even the vet can’t give him the injection that he needs so bad to fight the infection.” The problem was that he would also not let anyone tie his mouth, in order to inject the medicine into him, without risking a bite. Being a healthy, strong dog, people had reason to fear Kaloo when angry. But I knew I was not just any other person to him. And I knew that he knew that. I said to them, “I will give him the injection. I will try. I think he may let me do it for him.” I sat at his side, patted and kissed him, and took the injection from my brother who then stepped back. Looking at the syringe in my hands, Kaloo uttered a faint, muffled snarl. But the look on his face was not of anger; it was not of rejection; it was one that said, “Okay, I trust you.” I gave him the injection without tying him, or his mouth, or anything. He allowed me, and even licked my hands after I was finished. “This is what you call love,” remarked my father, witnessing it along with the rest of the family. I stayed home for a few more days, giving Kaloo more injections, and carrying him around. Then I went back to the city, returning shortly again to give him another dose of the medicine as prescribed. Kaloo recovered, and walked and ran again. I was truly happy to have him back to life. On my next trip home, in June 1999, while we were allowed vacation to prepare for the annual exam, I arrived to find Kaloo ill again. And this time, it was much more serious. He had got bloody diarrhea. Medicine had been bought for him, and we also took a lackadaisical Kaloo to the vet for treatment. He told us to use some medicine over the night and if the dog survived by the morning, he would have hope to make it. I sat by Kaloo’s side as he licked the medicine mixed in water. After each episode of licking at the water, he would look at me with dying eyes, and I caressed him with affection, scared down to my core of what was coming. He read it in my eyes and answered with his own: It’s over my friend. I value your love. Kaloo died that night, June 20, 1999, in my arms at around midnight. I was devastated, and I cried like I never had in my life before. Out of exhaustion, I finally fell asleep. And before I got up next morning, Kaloo’s body had been disposed. I missed him as anything – a friend, a family member, a kindred spirit. But soon, I would learn that he was not gone. He kept coming in my dreams, always as loving and playful and friendly as he had been to me, often running with me and filling me with fresh energy. In a non-physical way, he is still with me; always has been there. This evening’s dream was another episode of Kaloo’s continued love, 11 years after his physical death. This one, however, seems to have brought another message from him. In his life, we never thought of letting Kaloo breed. If we had, today I would be friends with one or more of Kaloo’s children. Maybe, beyond our knowledge, Kaloo did get a chance to breed that we never knew of. In any case, his love for me and his understanding of my feelings, as well as responding to them as a kind friend, have impressed its unforgettable mark on my life. Writing these lines 11 years after his departure, I am glad to express what an honor it is for me to be enjoying my friend’s love and loyalty from the world beyond the physical. Thank you Kaloo for being in my life! Ernest Dempsey is an author, freelance writer, editor, and citizen journalist based in Pakistan. Dempsey edits the print quarterly Recovering the Self (http://www.recoveringself.com) a journal of hope and healing published from Michigan, USA. He is also a regular contributor to news sites like Instablogs, Digital Journal, and News Blaze. Learn more Dempsey at his website http://www.freewebs.com/ernestdempsey/. His new blog Save Life is at http://catchingstraw.blogspot.com/.